In August of 1963, more than 200,000 activists from all over the country gathered for the March on Washington for Jobs and Freedom. The day was filled with speeches, musical performances, and the declaration of political platforms, whose common theme was racial equality in America. The largest demonstration in American history to that date, it marked the apex of the Civil Rights movement. These flyers document the speakers and issues that pressured President John F. Kennedy to draft legislation guaranteeing equal rights for African Americans. In 1954, the Supreme Court’s landmark ruling in Brown v. Board of Education declared segregated schools unconstitutional and sparkeda decade of groundbreaking civil rights activism and legislation.Using archival news footage, primary sources, and interview segments filmed for Eyes on the Prize, this collection captures the voices,images, and events of the Civil Rights movement and the ongoing struggle for racial equality in America. 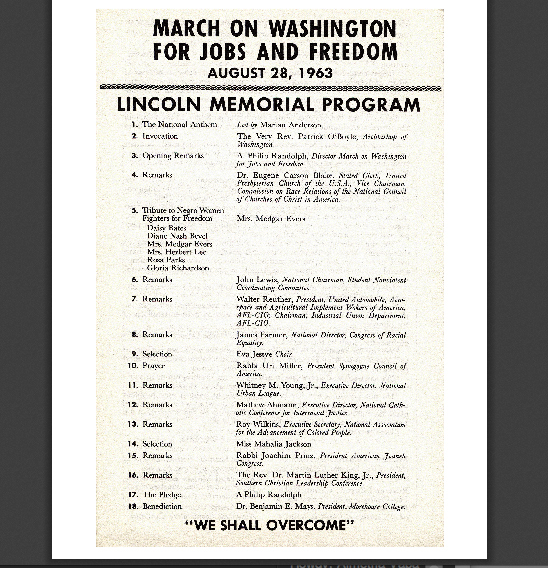 This program listed the events scheduled at the Lincoln Memorial during the August 28, 1963, March on Washington for Jobs and Freedom. The highlight of the march, which attracted 250,000 people, was Martin Luther King’s “I Have a Dream” speech. This resource group includes 2 primary source images, a background essay and a transcript. Students study Martin Luther King Jr.’s “I Have a Dream” speech and discuss the rhetorical influences on King’s speech, the oratorical devices that King uses in delivering his speech and how a speech is similar to/different from other literary forms. This act, signed into law by President Lyndon Johnson on July 2, 1964, prohibited discrimination in public places, provided for the integration of schools and other public facilities, and made employment discrimination illegal. This document was the most sweeping civil rights legislation since Reconstruction. This resource group includes 2 primary source images, a background essay and a transcript. PBS LearningMedia provides teachers with free access to innovative, curriculum-targeted resources aligned to National and Common Core State Standards. Drawing from PBS programs like PBS NewsHour, FRONTLINE, and American Experience, the service offers teachers more than 30,000 resources to enrich classroom instruction. Visit pbslearningmedia.org today!